^ Moreton, Cole (16 July 2000). "Reportage: The White Bike comes full circle" (Reprint). The Independent. Retrieved 28 December 2008. ^ "Freiradln". Radland.at. Archived from the original on 8 July 2007. Retrieved 25 May 018. 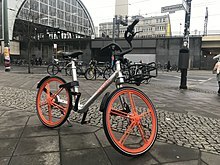 ^ "The Bike-sharing World Map is 10 years old". Bike-Sharing.blogspot.com. 9 November 2017. Retrieved 25 May 2018. ^ "Urban planning - Streetwise". The Economist. Gurgaon, India. 5 September 2015. Retrieved 4 September 2015. ^ Wang, Yue. "Return of Bicycle Culture In China Adds To Billionaires' Wealth". Forbes. Retrieved 4 July 2017. ^ "Why China's bike-sharing boom is causing headaches". South China Morning Post. Retrieved 4 July 2017. ^ Fannin, Rebecca. "Bike Sharing Apps In China Pop Up As Latest Startup And Unicorn Craze". Forbes. Retrieved 4 July 2017. ^ "China's bicycle-sharing boom poses hazards for manufacturers". Financial Times. Retrieved 4 July 2017. ^ Taylor, Alan. 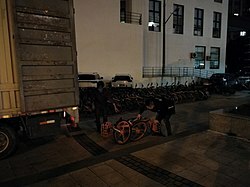 "The Bike-Share Oversupply in China: Huge Piles of Abandoned and Broken Bicycles". The Atlantic. Retrieved 28 November 2018. ^ "Dockless bike sharing will reshape cities, says Dublin start-up". Bikebiz. Retrieved 14 July 2017. ^ Sisson, Patrick (31 March 2017). 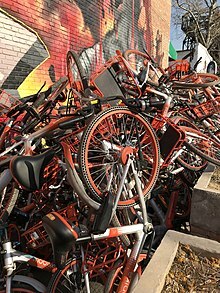 "Is dockless bikeshare the future of urban transit?". Curbed. Retrieved 19 July 2017. ^ "Simply Put: In China's bikeshare success, peek into big data potential". The Indian Express. 2 October 2017. Retrieved 12 October 2017. ^ Reuters. "Bike Boom Nibbles on Asia Gasoline Demand Growth". VOA. Retrieved 29 September 2017. ^ "Beijing issues guideline on bike sharing - Xinhua | English.news.cn". news.xinhuanet.com. Retrieved 12 October 2017. ^ Lazo, Luz (31 August 2018). "D.C. allows dockless bikes and scooters to stay, but you'll have to start locking them up". Washington Post. Retrieved 8 September 2018. ^ "Mobiped". Mobiped. 11 October 2010. Archived from the original on 22 September 2011. Retrieved 15 January 2012. ^ James May (21 October 2010). "May, James, ''Cycling Proficiency With James May'', The Daily Telegraph, 21 October 2010". London: Telegraph.co.uk. Retrieved 15 January 2012. ^ "Public Bicycles to Run on BRT System (Guangzhou): lifeofguangzhou.com, quoting english.gz.gov.cn, 19 Mar 2010". Lifeofguangzhou.com. Retrieved 15 January 2012. ^ Bejarano, Mauricio; Ceballos, Lina M.; Maya, Jorge (1 January 2017). "A user-centred assessment of a new bicycle sharing system in Medellin". Transportation Research Part F: Traffic Psychology and Behaviour. 44: 145–158. doi:10.1016/j.trf.2016.11.004. ^ Garthwaite, Josie (6 February 2012). "A Bay Area Experiment in Electric Bike Sharing". New York Times. Retrieved 25 June 2012. ^ "Lucas, Clay, ''Helmet Law Hurting Shared Bike Scheme'', The Age, 29 November 2010". Melbourne: Theage.com.au. 29 November 2010. Retrieved 15 January 2012. ^ "Link Bike". www.linkbike.my. Retrieved 26 March 2017. ^ a b c Hamilton, Timothy; Wichman, Casey (20 August 2015). "Bicycle Infrastructure and Traffic Congestion: Evidence from DC's Capital Bikeshare". SSRN 2649978. ^ "Time to regulate China's booming bike share sector". www.chinadialogue.net. Retrieved 9 July 2017. ^ Woodcock, James; Tainio, Marko; Cheshire, James; O’Brien, Oliver; Goodman, Anna (13 February 2014). "Health effects of the London bicycle sharing system: health impact modelling study". BMJ. 348: g425. doi:10.1136/bmj.g425. ISSN 1756-1833. PMC 3923979. PMID 24524928. ^ Haas, Benjamin (25 November 2017). 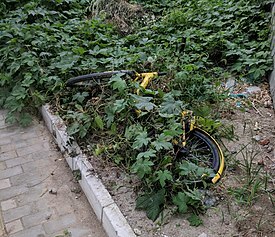 "Chinese bike share graveyard a monument to industry's 'arrogance'". the Guardian. Retrieved 5 March 2018. ^ "Bike sharing: Research on health effects, helmet use and equitable access". Journalist's Resource. 5 April 2018. Retrieved 6 September 2018. ^ "Who is responsible for helmets when it comes to bike shares?". SFGate. 30 August 2017. Retrieved 6 September 2018. 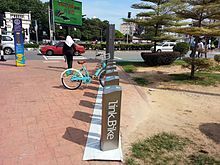 ^ "Capital Bikeshare Launches in Alexandria". Capital Bikeshare. 31 August 2012. Archived from the original on 5 March 2016. Retrieved 24 April 2015. ^ Horwitz, Josh. "One of China's top bike-sharing startups is now paying users to ride its bikes". Quartz. Retrieved 7 March 2018. ^ "Tech in Asia - Connecting Asia's startup ecosystem". www.techinasia.com. Retrieved 7 March 2018. ^ "The Sharing Economy is Learning How to Ride a Bike". Energy Institute Blog. 20 February 2018. Retrieved 7 March 2018. ^ "Are taxpayers being taken for a ride with GREENbike? | KSL.com". Retrieved 5 March 2018. ^ a b "Reality check: Public bike sharing costs the public virtually nothing - Better Bike Share". Better Bike Share. 8 August 2016. Retrieved 5 March 2018. ^ a b Lindsey, Joe (1 December 2016). 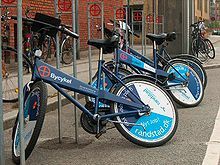 "Do Bike Share Systems Actually Work?". Outside Online. Retrieved 5 March 2018.